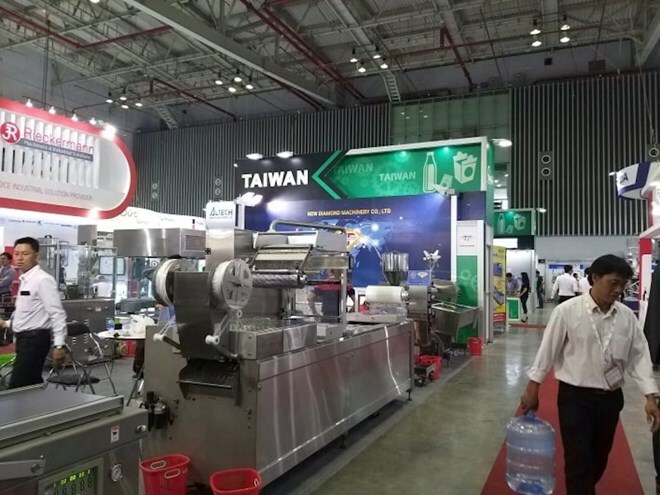 HCM City (VNA) – The 14th International Processing and Packaging Exhibition and Conference (ProPak Vietnam 2019) kicked off at the Saigon Exhibition and Convention Centre in Ho Chi Minh City on March 19. The three-day event attracts the participation of 540 exhibitors from 31 countries and territories, including first-timers such as Vietnam’s Dai Chinh Quang and Thien An Loc companies, China’s Beijing Omori Packing Machinery , and Sidel India. BT Tee, General Manager of UBM VES – the exhibition’s organiser, stated that the processing and packaging sector is facing several difficulties, including the overuse of plastics in production and the lack of orientations on environmental protection. Therefore, Propak 2019 wants to introduce new technologies that can solve these challenges. Paolo Lemma, Italian Trade Counselor in Vietnam, said that Propak Vietnam is one of the important annual events of Italian businesses in the Vietnamese market. Last year, Vietnam imported machines and equipment in this field worth 25.2 million EUR (28.6 million USD) from Italy, up 2.4 percent year-on-year. More than 20 Italian enterprises are taking part in Propak Vietnam 2019 to introduce their products and new technologies, he added. A wide range of new technologies are expected to introduced at the fair, including those in processing, packaging and bottling of food-beverage, pharmaceuticals and cosmetics, along with printing machinery and materials, among others. In addition, the Vietnam Association of Food Science and Technology (VAFoST) will join hands with competent authorities to organise the “Food Engineering and Packaging for Sustainable Development” seminar, which is expected to lure many domestic and international experts. ProPak Vietnam is the premier sourcing and networking trade event for food, beverages, and pharmaceutical processing and packaging technology in Vietnam. Since its inception in 2003, ProPak Vietnam has grown steadily in stature and prestige to become a regional industry hub which has helped evolve and improve the processing and packaging sector in Vietnam and beyond.